There is a new product in town. Flowmailer is platform for sending automated emails in a professional way. MailPlus, the Dutch ESP that is behind Flowmailer, received more and more requests from clients concerning specific automated email delivery situations. It became clear a solution had to be found for their transactional, automated and process-related email. One of the problems marketers noted is that they are unhappy with the look and feel of their automated emails. More often than not, it’s not possible to change that look and feel to include a company’s own corporate style and fonts. The reason for this is that those automated emails are often sent through CRM, financial administration or web store software and platforms. Those systems aren’t geared towards sending well designed emails. Also, those emails can’t be managed by marketers, which is the reason they don’t control that specific stream of communications. With the Flowmailer Saas email software, marketers have the possibility to use their own templates for different kinds of email messages. This way, the look and feel and corporate styling of those automated emails can be guaranteed. With the above advantages three major problems will be solved that marketers encounter with the current way automated emails are sent out via various systems. Another problem with CRM, financial administration or web store software systems is that the delivery of emails is hidden or not available at all. If emails don’t arrive at their intended recipient, there’s no way to know. This can lead to difficult situations for web stores, notes product manager Richard van Looijen: “Customers who place an order will get an automated confirmation email. If the customer has a question about that order, an employee first has to ask several questions: he doesn’t know what has happened with the confirmation email. Even worse, what if a customer calls and says he hasn’t received the confirmation email at all. Where do you start searching then?”. The same technology that has been in use for MailPlus will be used for Flowmailer. The MailPlus email marketing platform has been in use since 2004. It currently has over 2750 users including marketers, communication professionals and (r)etailers using it for their email marketing campaigns. Van Looijen: “We will deliver nearly 1 billion marketing emails this year with MailPlus: why not use our experience and technology for a wider audience and deliver messages from other systems in an optimal fashion –and- completely in the correct corporate look and feel?”. Flowmailer is, just like MailPlus, a SaaS solution (software as a service). The platform is available as a service and can be managed from the browser. 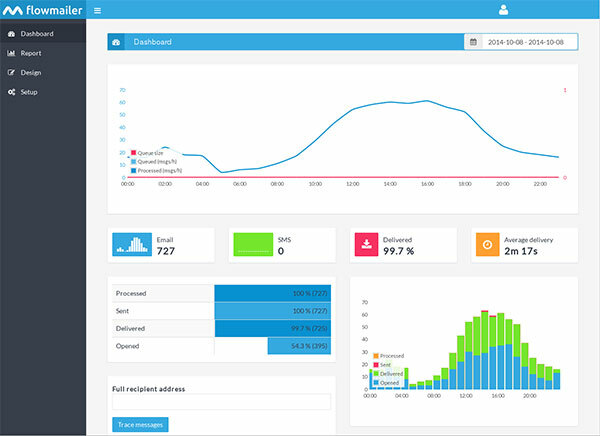 The dashboard offers insights into the automated and process-related emails sent out every day. Besides that it’s possible to view specific email streams. The platform can be easily managed by marketers. “Marketers can decide for themselves which template will be used for which email, but they can also select a different subject line”, notes Van Looijen. Any system that can send out email, like a CRM system, a web store or an ERP platform, can send email through Flowmailer. The platform has been designed in such a way that it can be set up in an easy fashion, without an extensive and costly implementation project. Flowmailer: we deliver your message. Professional automated email delivery, of transactional and notification type messages.